I noticed this painting of the Protomartyrs of the Order on Italian Wikipedia. 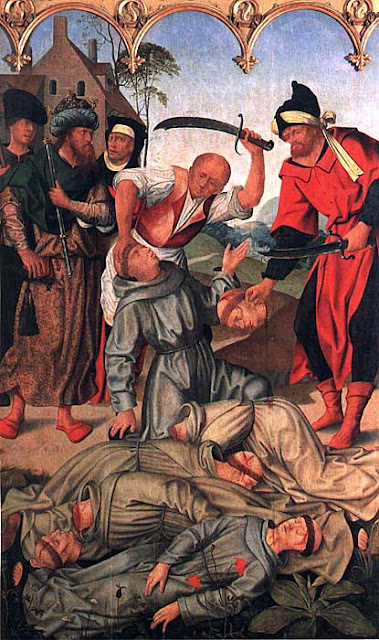 It made me think that perhaps we can seek the intercession of these friars in our time when we have been made so aware of beheadings and other barbaric executions. St. Francis himself sent Brothers Berard, Otho, Peter, Accursius, and Adjutus to preach in Spain. After preaching in a mosque they were arrested and deported to Morocco. There they began to preach again and were again arrested. After torture and efforts to tempt them to convert to Islam, they were beheaded on this day in 1220. For a longer treatment of their martyrdom, you'll want to read the Chronicle of the Twenty-Four Generals of the Order of Friars Minor. Search for Appendix I, which contains their story. It's one of my favorite little spells, this last bit of the Christmas season following Epiphany. In the States, with Epiphany celebrated on a Sunday, you get a week of it. Here in Italy, where Epiphany is still celebrated on the traditional sixth of January, you get from zero days to a week in between Epiphany and the Baptism of the Lord, depending on how things fall. St. Peter Chrysologus in the Office of Readings today: "In choosing to be born for us, God chose to be known by us." The Lord's birth is after all something fairly secret; he is born away from home, in an obscure place, to poor parents, to a small people. In the same way the birth of the presence of God within us always has some sense of secret, of an intimacy not easily communicated to others, of something precious and utterly personal. But secret doesn't mean private. Or what is born in secret the Holy Spirit doesn't mean to remain private. And thus we come to Epiphany, to the Magi. In the same way, the graces that the Holy Spirit conceives in our lives are not only for us, but for offering in service and in helps to the salvation of others. In this way the Holy Spirit conceives us as Christ-ians, those who are in Christ, those who become the members of Christ and instruments of his saving work and his peace. In the Magi is the first public revelation that Jesus Christ is the God of all, the King of the Universe, as we celebrate him at the other end of the liturgical year. They are the forerunners of all of us who are not descended from the patriarchs by blood, but have been grafted into the "Israel of God" (Galatians 6:16) in Christ. They are the patron saints of all who surrender to the truth that all human knowledge, all true created wisdom, lead to Christ. In Christ, all people have been called, invited into the promises made to Abraham. Christ is the beginning of the new creation, his birth a decisive break with the old creation corrupted by sin. This is why he is born of the Virgin, for his birth is a break with the generation of human history. And this is why her Immaculate Conception is the first light of the new creation which dawns in Jesus Christ. In surrendering the death that is our sin into his death on the cross in our baptism, we have risen again as citizens of the new creation.